Tarazod Films & Media LLC: Documentary Gets New Working Title - "The Snow White Effect"
Documentary Gets New Working Title - "The Snow White Effect"
Back in January 2011, we started tossing ideas around for a new documentary. At the time, we were calling it Dark Ride. This was in reference to a specific style of theme park attraction which is enclosed and requires artificial lighting to achieve its dramatic effects. The vagueness of the title was a direct result of us not knowing quite what the focus of this project would be. Shooting began in March of that year in Orlando. 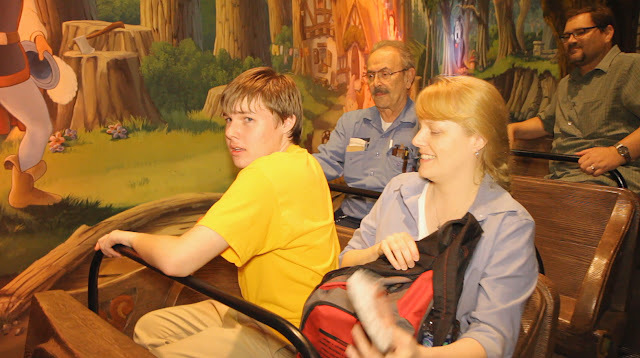 Before heading back to Florida for a second round of filming in May of 2012, we updated the movie title to Ben's Snow White Adventures: Autism and the Dark Ride. Ben Miles' love of the Walt Disney World attraction would be the heart of our story. Yet, it was still unclear as to what direction it would go. Two more years passed. A third visit with Ben and his family garnered more quality footage and another updated title, The Snow White Adventures of Benjamin Miles. It's now been close to five years. A handful of interviews still remain to be shot. With the recent culmination of a few of our other long-standing video gigs, we now have a window of opportunity to make hay with the edit on a couple of personal projects--including Ben's film. With time has come a better understanding of what we have. As a result, a new working title has emerged: The Snow White Effect: An Autistic Boy's Love for the Disney Dark Ride. Still not exactly what we're looking for, but we'll try it on for size.